ABSTRACT Cultivated peanut (Arachis hypogaea L.) is a Papilionoid grain legume crop, important throughout the tropics. It is an allotetraploid of recent origin with an AB type genome (2n= 4x= 40) and has very low DNA polymorphism, a characteristic that has hampered genetic studies. The A and B genomes are of similar size and are composed mostly of metacentric chromosomes. The A genome is characterized by a pair of small chromosomes and the presence of strong centromeric heterochromatic bands, in contrast, B chromosomes are all of similar size and have much weaker centromeric bands. 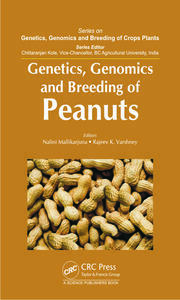 The genome of peanut is estimated at about 2.8 Gb and with a high repetitive DNA content. Its most probable diploid ancestors are A. duranensis and A. ipaënsis, donors of the A and B genomes, respectively. These two subgenomes diverged from a common ancestor about three and a half million years ago, more recently than the subgenomes of cotton or soybean. Consequently, homeologous A and B genic sequences have very high sequence identity. Genetically, cultivated peanut behaves as a diploid. The two subgenomes have very high genetic synteny, and do not appear to have undergone major structural rearrangements after polyploidization. Indeed, the peanut subgenomes even have detectable genetic synteny with other legumes that diverged during evolution about 55 million years ago. The patterns of synteny indicate that the A and B genomes are diploidized, and that gene-space is likely to be ordered into about ten conserved blocks. In contrast to their conserved genetic synteny, the repetitive DNA components of the subgenomes are very significantly diverged. This may be substantially explained by the activity of a few retrotransposons since the time of genome divergence. In addition, the peanut genome harbors many miniature inverted-repeat transposable elements that have been active since polyploidization. This activity has probably contributed to the phenotypic variability of peanut. Link to book on publishers website. This entry was posted in Publications, Research, Species and tagged arachis, breeding, chromosomes, genomics, hybrids, legumes, peanut, polyploids. Bookmark the permalink.